It's time for me to test the Play Framework and I'll try to make some posts during my tests about this web framework. Efficient Template System : The template system is really easy to use, based on Groovy. Pure Java : You make only Java and HTML, no other things to learn and easy integration in IDE. Fast : The startup of application is really fast the rendering of the pages also very fast. In this post, we'll see how to install the Play Framework and how to write our first Hello World. Before installing Play Framework, you need Java 5.0 or later. 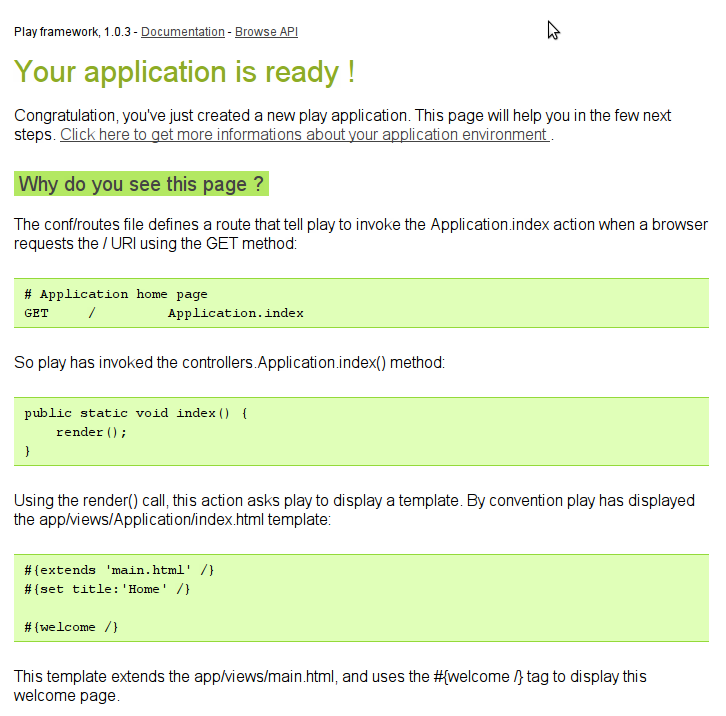 Then, you can download a release of Play : http://download.playframework.org/releases/. The latest when I wrote this post is the 1.0.3 version. So let's download this version. After that, just unzip the given archive where you want to install the framework. After that, you just have to add the play command to the path. Depending on your configuration, you perhaps have to use sudo for the chmod command. For other systems (Windows and Mac), you also have to add play (play.bat for Windows) to path using the system configuration. ~ OK, the application is created. 17:50:01,670 INFO  ~ Application 'Hello World' is now started ! Here we are ! 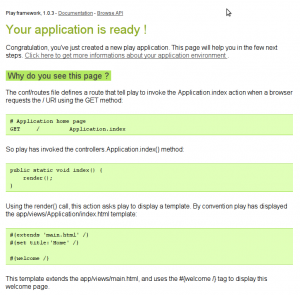 With this framework, it's extremely easy to create web applications. And we've only see a very small part of the facilities this framework offers to create web applications. I'll try to write others posts on the subject.